Ragtime, I hope they stay in business for 50 more years. Ragtime (by Terrence McNally, Stephen Flaherty, and Lynn Ahrens) traces the lives of various characters in turn-of-the-century New York. These include an upper-class family, a poor Jewish immigrant, and a Harlem musician, along with a smattering of historical celebrities. With an exuberant score and powerful lyrics, Ragtime has been hailed as one of the best musicals to appear in the last few decades. And in the hands of The Gallery Players, Ragtime flourishes. Under the capable direction of Mark Harborth and his talented cast, the musical is compelling, entertaining, and heart-wrenching. In the role of Sarah, Renee Steadman dazzles. Both her amazing vocals and her convincing performance mark her as one of the stand-out stars of the play. But that’s not to say Steadman is the only star. As Mother, Heather Koren also shines, as do James Zannelli as Tateh and Marcus Jordan as Coalhouse Walker. All four actors combine soaring vocals with a heartfelt performance, and similarly talented performers fill out the other roles. Alex Bird is perfect as Younger Brother, and Elyse Beyer and Doug Chitel bring incredible energy and force to the roles of Evelyn Nesbit and Harry Houdini. Also, Jonah Mussolino is perfect as the Little Boy whose narration opens and closes the play. 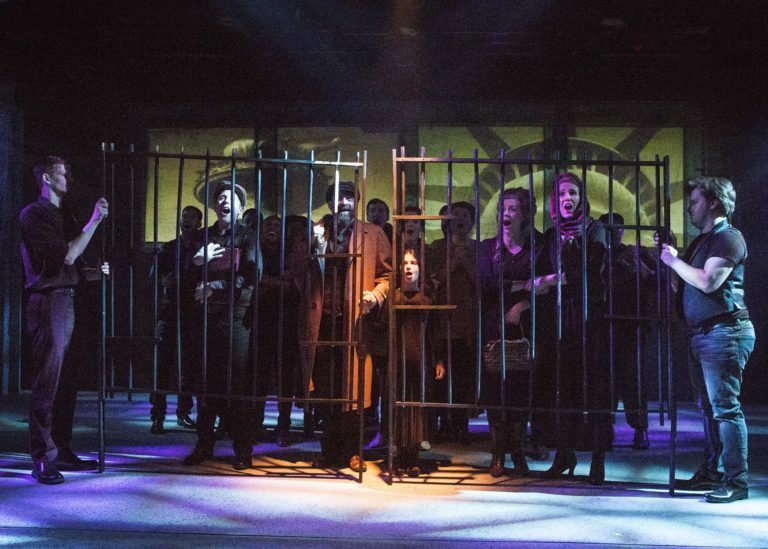 The vocals in this production of Ragtime make the show a must-see – for both long-time fans of the musical and for newcomers. But if you don’t go for the vocals, go for the dance numbers. Brilliantly choreographed and seamlessly executed, the dance scenes in this production of Ragtime are fun and full of vitality. I especially enjoyed the Harlem numbers, when the cast swings to ragtime music, and their energy spills into the audience. My congratulations go out to whoever was responsible for this play’s blocking and choreography – which can only be described as wonderful. A note in the program explains that the director chose to use a music track instead of a live orchestra, and in my opinion, he made the right choice. While a live orchestra is usually preferable, the score of Ragtime deserves full orchestrations, and if a full orchestra doesn’t mesh with a theater’s resources or venue, then a recorded track is the next best option. The production’s only failing (and it’s a small one at that) was volume-related. There were a few times I had trouble hearing spoken lines over the music, which meant I missed a couple of things here and there. It was a minor issue, but with such a fantastic script, I would have liked to have caught those few lines. Looking around the audience, I saw young adults, families with children, and senior couples, proving yet again that the music of Ragtime resonates with everyone.